At Berchem Moses PC, we work timelessly to develop successful attorney-client relationships based on mutual trust and respect. Our firm is committed to serving our clients needs and achieving their goals. We listen carefully to their concerns and objectives and we provide creative legal solutions while never losing sight of budgetary constraints. Our attorneys maintain a commitment to professional excellence unmatched in the state of Connecticut. We welcome the opportunity to assist you with your legal concerns, whatever their complexity. 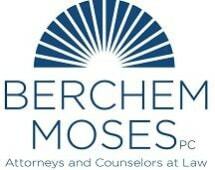 For the highest level of service available anywhere in the legal community delivered in a cost effective manner, contact the Connecticut law firm of Berchem Moses PC. With offices in New Haven and Fairfield Counties the law firm of Berchem Moses PC, represents clients throughout the state of Connecticut, including the cities of Bridgeport, Hartford, New Haven, and Stamford, and throughout Fairfield County, Hartford County, Litchfield County, Middlesex County, New Haven County, New London County, Tolland County, and Windham County. Our firm also represents clients nationally. Stop & Shop Supermarkets, Inc.